When we think of our homes, we tend to envision our living rooms, bedrooms, kitchens—the interior spaces we spend most of our time in. But what about exterior spaces? Using timber frame construction to build elements such as outdoor kitchens, decks, and porches is a beautiful way to increase and enhance your overall living space. Timber frame construction can be used for outdoor projects both large and small. Love entertaining by the pool but get tired of constantly going inside for food, drinks, and other supplies? A pavilion with an outdoor kitchen is the perfect addition for you. Have stunning views but can enjoy them only from indoors? A porch or deck can provide added space to soak them all in. Need some shelter from the sun? Consider adding a pergola. All of these structures provide an opportunity to increase your living space and beautify your home’s exterior. Using timber frame construction provides a cohesive look with your existing timber frame home, as well as the same benefits—unsurpassed strength and durability, timeless elegance and beauty, and flexible custom design to suit your unique personal taste. But where do you start? What do you need to consider? Creating outdoor living space requires some slightly different thinking than when creating your indoor timber frame floor plan. How much can I afford to spend? What is my budget? Do I have enough space for what I’d like to build? How much time and effort am I willing to devote to maintaining an outdoor space? Is my property ready to build on? Or will it require major excavation? How will the changing seasons affect my outdoor living space? Will this be a seasonal or year-round space? Should I consider an outdoor fireplace? 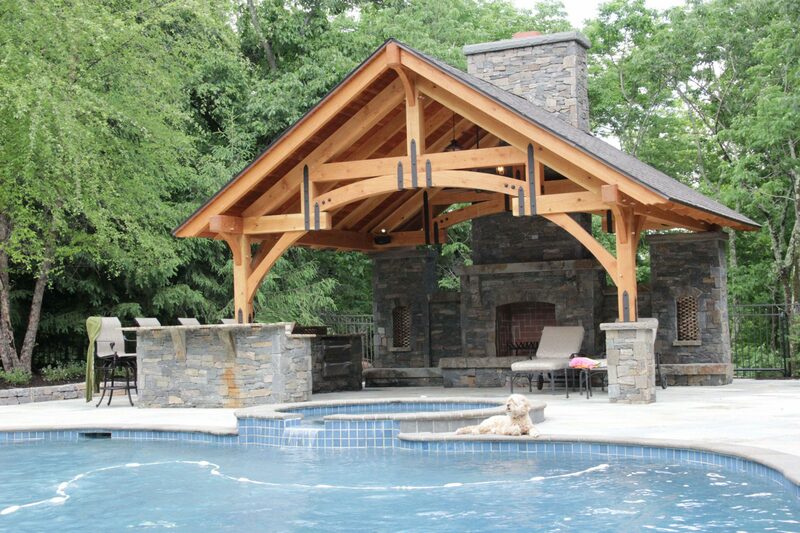 At Mid-Atlantic Timberframes, we can help you navigate these and any other questions and concerns you may have about adding outdoor living space. We’ll work with you to design the porch, deck, pavilion, or any other project you desire to complement your timber frame home and get you in the great outdoors. Are you ready to take the indoors outside? Contact us today. Previous - Timber Frame Questions? We Have Answers!